To celebrate this declaration, let’s take a look through our collection at some of the diseases that affected previous generations, the impact they had on Peel residents, and attempts to control their spread. Aboriginal medicine, Rubella (German measles), polio, measles, and typhoid all make appearances in this post. Just as red pandas aren’t bears, German measles isn’t measles. Now known as Rubella, this separate infection is unique from measles, sharing only the rash. One symptom, however, is nearly constant, viz., giddiness, and it is the only constitutional symptom of the disease. Children with rothelin (sp) will engage in their usual amusements, eat heartily, and sleep well, and, although covered with the lentil rash, will complain of nothing but a feeling of staggering. The 1949 Brampton Excelsiors senior lacrosse team was in the midst of a strong season, which would see them reach the Ontario Lacrosse Association finals against the Hamilton Tigers. In the August 17 game, local newspaper the Conservator described Carl Madgett as “the big gun in the Excelsior scoring, putting three goals and setting up two more.”(2) Their 8-7 victory helped solidify their lead on first place in the league. Madgett was a top athlete in town, as a previous winner of the Excelsiors’ Pete Anthony Medal as the team’s MVP, held in “high esteem by team-mates and rivals alike,” representing Brampton provincially during the winter basketball season the previous year, and competing in the town’s hockey league. After hospitalization, Carl still maintained active involvement in the community. A coach for the Excelsiors, his involvement away from the box was acknowledged through induction into the Canadian Lacrosse Hall of Fame as a builder, and he is the namesake of the 4H Peel leadership award. Immunization drives would eventually limit the amount of cases. According to Peel Public Health, Peel has not seen a case of “wild poliovirus” since the 1970s, and Canada was certified polio free in 1994. 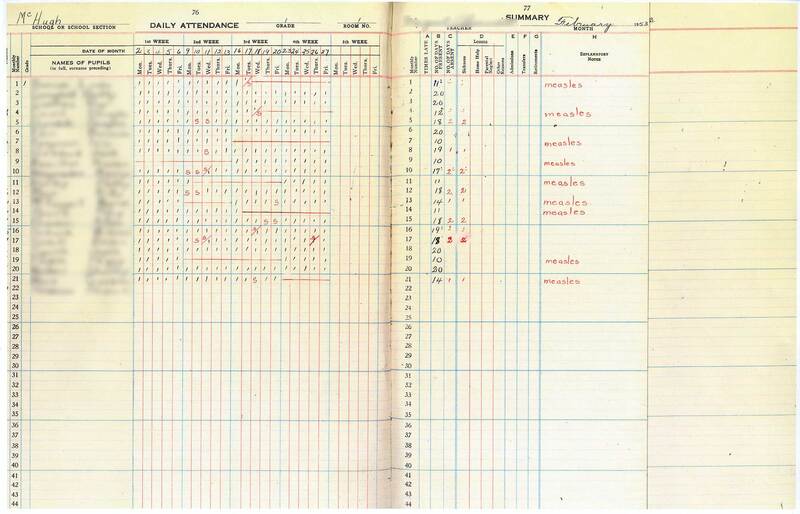 One of our earliest posts on this blog, “Why education records matter”, included this page from an attendance register. From a class of 22, nine students were all struck down by the infection, at a Brampton school in 1953. Archivist Samantha Thompson selected this example to show how school records document the changing patterns in illness. This page from a daily attendance register shows the toll measles could take on a class of children prior to the availability of vaccination programs. Student names are blurred to maintain privacy. (Peel Archives, Peel Public Education Records, McHugh School, Daily Register, February 1953.) Click on the image for a closer view. These records contain personal information protected under provincial and municipal privacy legislation, depending on the age of the record. It’s important to know that no one can access your school records but you or your designated representative. For more information, contact us. Starting 1 February 1996, all Peel school children began receiving a second dose of the measles vaccine. This photo from the Brampton Guardian fonds was taken at a Regional public health office, 199 County Court Boulevard, Brampton. In the incident involving the detainee with Typhoid, the individual was discharged from hospital and returned to the detention centre with no precautions to prevent the spread of disease to detainees, security/immigration/hotel personnel and the community. He returned to his room with another detainee. His bedding and towels were collected and laundered along with the other laundry items from the detention centre and the hotel which is occupied by travellers and the general public. The report suggested an isolation room be established, and precautions that should have been taken with food, laundry, and any other soiled material from his room. This blog post used research from Wm. Perkins Bull fonds that is currently being processed; the book From Medical Man to Medicine Man, part of the Perkins Bull Historical Series; the Russell K. Cooper fonds and various online sources; Peel Board of Education fonds, McHugh School files and Brampton Guardian fonds; Region of Peel fonds, Communicable disease control, 1984. (1) Stella McKay, Dangerous Nuisance: Measles Often Ignored, Kills More Than Polio, The Globe and Mail, 8 November 1956. (2) “Excelsiors Win”, Conservator (Brampton), 18 August 1949. I had the pleasure of meeting Carl Madgett several times at the Peel Archives. He led a very full life but the effects of polio stayed with him until his death.